The Social and Economic Museum of Vienna employed three graphic artists connected with the 'Group of Progressive Artists' centred in Cologne: Gerd Arntz, Peter Alma and Augustin Tschinkel. Shown here is a small selection of 'free work' by these three artists and by Franz Wilhelm Seiwert, the Cologne group's leading figure. The museum collected work of this kind as part of a larger archive of 'visual education', entitling it 'sociological graphics'. Gerd Arntz recognised influences ranging from Greek vase painting to French Purism. In contrast to the abstraction of Russian Constructivism, he described his own work as 'figurative constructivism'. This naturally suited the purposes of the Vienna Method of Pictorial Statistics, which required simplified icons that made clear connections to physical objects. 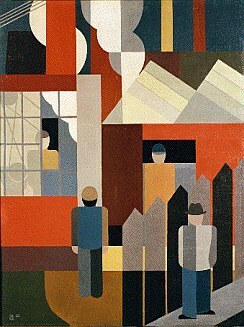 Arntz did not produce many oil paintings, concentrating instead on monochrome woodcut and linocut prints. He always found his paintings difficult to sell, as he commented late in life. This is the earliest of his oil paintings to have survived.